Despite its complexity, Cities: Skylines doesn’t try to tackle every aspect of a city simulator. 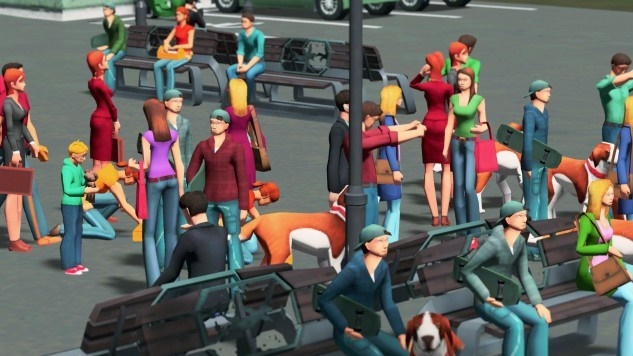 Its developer, Finnish studio Colossal Order, is primarily known for city-builder sims that prioritize transit over most all other facets of city design. This influence is apparent in Skylines, as the game offers multiple different view perspectives emphasizing traffic density, metro and bus lines, and incoming/outgoing city connections. For the first few hours of a city, you run from emergency to emergency, routing water and power, zoning new areas to satisfy demand, and focusing on the basics of urban development. Eventually, it becomes impossible not to notice that the citizens of the city itself (“cims,” in the game’s language) become mere abstractions of their real-world counterparts, and in doing so, Cities: Skylines inadvertently becomes a gentrifier’s dream. Skylines presents a city as a system of moving parts, fluid and for all practical purposes, interchangeable. What was a block of residential housing can be flipped immediately into a high-yield industry zone with the click of a mouse. The cities of Skylines are less places where people live, and more where people commute. Cims are abstracted into patterns of movement, traffic, and retail and labor patterns, but they don’t raise too much fuss about things. They move within the parks and open spaces of a city, but don’t tell you which park is their favorite, or which street is more pleasant to walk down. It’s in the cims that Skyline grapples with its most crucial design question: how much to simulate? Pure common sense dictates that you wouldn’t want to simulate every desire and need of each cim, and modern computing power means that not all of a cim’s personal variables can be handled in-engine. It’s a compromise: lower real population count means that the game engine can simulate visually each cim in a city, even if that cim’s behavior is more akin to a group of a hundred. With all design, however, there is meaning communicated beyond what is chosen to be shown, either intentionally or unintentionally. One of the first things you are taught in Skylines is that individual entities (that is, cims, buildings, and pieces of road) largely do not matter. Destroying a building to make a new road connecting multiple blocks isn’t even something that you think about as the game progresses. It is simply an understood act of expansion. The individual details of a neighborhood are barely addressed, and when they are, they’re largely boiled down to a single “land value” rating that is strengthened by proximity to local parks or attractions. All of these design choices (detached and omnipotent viewpoint, cims being abstracted avatars of group though, focus on macro city design) combine to push a very pointed, linear understanding of how cities grow and change. In real municipal growth, there is no omnipotent creator throwing down roads as they see fit, and neighborhood changes are largely considered on a local level. In addition, changes in real cities are slow, often taking months or years for even initial concepts to be drawn up. Skylines doesn’t bother with any of that, though. Skylines ponders the best way to run a city, and decides that it’s “with all power concentrated in the most high.” This is, to be fair, par for the course in city simulators, which require an inordinate amount of power vested in the player in order for things to move along. It’s a compromise. It moves things forward in game design at the expense of slavish realism. Cims have a small number of variables that the game cares about There are the ones that are effectively window-dressing (name, occupation, etc. ), and then there are the important ones (level of education, where they live, health status). Of the “important” variables, it is education that is the most often considered by the player. There are four levels of education in Skylines: uneducated, some education, well-educated, and highly-educated. These education levels determine, most chiefly, which jobs the cim will pursue, and which they will be judged as suitable for. Low-skilled jobs call for uneducated workers, higher-skilled jobs for higher-educated workers. As a player, you can somewhat shape the education of your population by placing schools and universities in your neighborhoods, and the proximity to each education site determines the average education level of the surrounding neighborhoods. More educated workers need higher-skilled jobs. Higher-skilled jobs pay more. Wealthier cims need more commercial zones to buy things, which rely on low-skilled labor to be staffed with. The easiest solution that Skylines offers is, in effect, a slow and steady gentrification of a city. I replaced my low-skilled, low-rent industrial zones with high-skilled offices. I razed inner-city suburbs to put in high-density housing aimed at young adults (in Skylines, young adults arrive at a city more skilled than families), and forced lower-skilled, less prosperous families to outer suburbs. The effect was simple, and fast: my city center became packed with fresh, skilled workers, and those without education (and therefore, job prospects) were re-housed in the far outer boroughs, away from most of the amenities of the downtown area. Keeping the low-skilled labor pool populated was simple: not building any schools in these outer boroughs kept the general education level down and the residents stagnant. The downtown sectors had plenty of available low-skilled labor, and plenty of rich citizens to shop their markets. I had a prosperous city, all due to the casual cruelty of strategic gentrification. Skylines, ultimately, doesn’t care about people. They are nearly worthless in the eyes of the game, expendable and mattering infinitely less than the social architecture upon which they scuttle. I found myself carrying out gentrification efforts, not with glee or horror, but indifference. Why should I care about the people of the city? They say nothing when I rip out their sidewalks. They passively chart optimal paths to their workplaces around the traffic-clogged main streets. They are aesthetic, not simulation. In a 2014 piece for Al Jazeera, Sarah Kendzior wrote that “gentrifiers focus on aesthetics, not people. Because people, to them, are aesthetics.” Anecdotally, I think she was right. When I am asked to act as gentrifier, the first thing I am taught is that people are aesthetics. They don’t really matter. Move them, displace them, push them out—all they can do is throw up a sad face. Dante Douglas is a writer, poet, game developer, and editor of Deorbital. You can find him on Twitter @videodante.